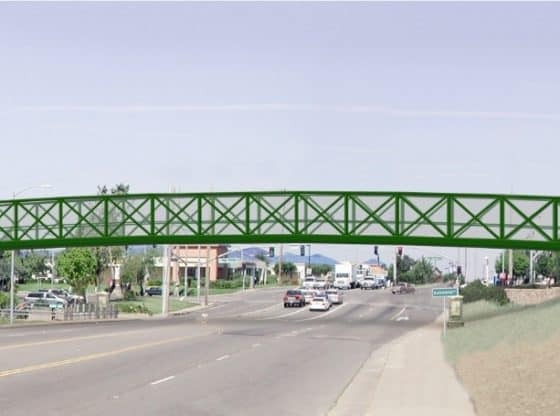 A new 475-foot-long bicycle and pedestrian overcrossing on East Bidwell Street, near Creekside is to be installed in the next week. Delivery and installation of the pre-fabricated overcrossing segments requires temporary closures of Harrington Way and E. Bidwell Street near Blue Ravine Road on the nights of June 30 and July 7. Six semi-trucks will deliver the three large bridge segments on Wednesday, June 30, requiring a one-lane closure of E. Bidwell Street and a complete closure of Harrington Way between 6 p.m. and 3:30 a.m. the next day. Signs will be posted warning that parking on both sides of Harrington Way will be prohibited on June 30. The overcrossing segments will be installed on Wednesday, July 7, requiring a one night closure of E. Bidwell between Blue Ravine Road and Creekside Drive between 8 p.m. and 6 a.m. the next day. After the bridge segments are installed, construction crews will continue work on the approach ramps leading to the overcrossing on both sides of E. Bidwell Street. The 475-foot-long, 12-foot-wide overcrossing is scheduled to open in the fall. Federal funding, including grants and stimulus funds, covers the approximate $2 million cost of the overcrossing.